ny contemporary, commercially available wheelchair cushion may generally be categorized as either a foam, air, gel, honeycomb, hybrid, or dynamic cushion. While many cushion designs represent a hybrid of the aforementioned elements, the category designations generally refer to the primary weight-supporting mechanism employed at the buttocks-cushion interface. oam-only cushions consist entirely of foam, are light in weight, and do not leak (since there is nothing to leak). Observations by physical therapists, rehabilitation professionals, and cushion users indicate that typical foam-only wheelchair seat cushions are among the least effective cushions with regard to sustained seat-related skin and pressure management. 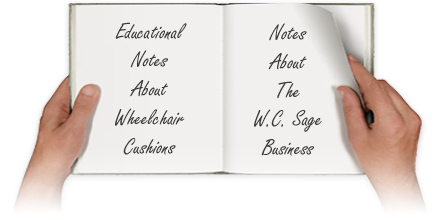 WC Sage does not offer typical foam-only wheelchair seat cushions as a result of this evidence and individual user testimonies. Some foam cushion structures; however, comprise multiple layers of varying foam materials. These particular cushion structures usually exhibit a soft top layer — often a memory-foam material — atop progressively firmer lower layers. Some of these particular foam-only cushions have proven to be suitable for some people who must remain seated for hours each day. The dynamic cushion category	represents seating solutions that use mechanically active (i.e., dynamic) components. This type of cushion is particularly effective in situations involving an acute mobility restriction as may occur from a high level spinal cord injury or from a non-injury-related restriction such as the cockpit seat of a fighter plane. At the time of this writing, all dynamic wheelchair cushions employ actively pressurized air cells to facilitate the pressure management function. Dynamic cushions are the most costly and mechanically complex of all cushion types. Unlike other cushion types, dynamic cushions must be powered—usually with a battery or other electrical source. ontemporary honeycomb cushions are made of a cell-based structure that is geometrically similar to natural honeycomb. This type of wheelchair cushion is among the lightest of all cushion types. A honeycomb cushion's many tiny perforations—a Supracor design feature (Supracor being the sole manufacturer of full honeycomb cushions at the time of this writing)—in conjunction with its open cell honeycomb structure, permits a degree of air circulation helpful in preventing excessive localized heat build-up and skin maceration. Gel cushions address the seat area pressure problem by distributing the person's weight upon a gel-filled or fluid-filled cell. From a pressure relief perspective, the wheelchair cushion's gel or fluid component may be thought of as simulating an additional layer of flesh in which a person's seat-area physique floats. Gel cushions exhibit excellent pressure distribution properties and typically employ a foam base structure. The gel or fluid components require periodic kneading (similar to kneading bread dough) in order to maintain their original suppleness. n air cushion relies upon a fixed volume of air distributed among various cells to accomplish the weight bearing and pressure distributing functions. Some air cushions exhibit a valve or valves with which the volume of air within the cells may be manually set. A newer type of air cushion permits changing the cushion's air volume by the use of many small, individually sealed air cells that can be added to, or removed from, the inside of the cushion. Hybrid cushions, as the term suggests, are cushions with weight-bearing components of more than one material category (foam, gel, air, etc.). In the context of wheelchair cushions, the recent commercial use of the "hybrid" term (e.g., the Sunrise Medical Jay J3 cushion with its air PLA insert options and the Roho Hybrid Eite cushion) is actually a bit dated chronologically. Typical gel cushions; for example, have long been composed of a weight-bearing foam base on which a weight-bearing gel component rests (i.e., a hybrid cushion). The actual historical entrance of a "hybrid" wheelchair cushion notwithstanding, the recent commercial use of the "hybrid" term is accurate. In this context the "hybrid" term is also helpful when referencing the more recently introduced wheelchair cushions that are composed of; for example, a foam base in which rests a weight-bearing air-filled component, or on which resides a honeycomb-structured layer. Wheelchair Cushion Sage has been established for the purpose of making an adequate profit by commercially connecting individuals to—what WC Sage considers to be—the best wheelchair cushion and wheelchair product manufacturers in the world. hen you order from Wheelchair Cushion Sage, the manufacturer ships your order directly to you. The service provided here is of value in that individuals may secure the best wheelchair cushions and wheelchair-related items at good prices from the associated manufacturers. Items are not returnable. Refunds are not provided. All orders are shipped using a trackable shipping method. The "Fast" shipping option is 1-2 business days and the "Med" shipping option is "4 Business Days." These shipping times are applicable only when: the order is placed before noon EST (eastern standard time) Monday through Thursday and, the item is in-stock in your specific size and with your specific options (i.e., the manufacturer does not have to make the item before shipping it). The full manufacturer's warranty comes with every purchase. In like manner; warranty issues and defective merchandise are addressed in accordance with the associated manufacturer's policies and are subject to the manufacturer's restocking and return shipping fees. Checks may be used as payment only when Wheelchair Cushion Sage is contacted prior to ordering. Checks must clear before the associated orders are shipped. A substantial fee will be charged for checks that bounce or otherwise fail to properly clear. Wheelchair Cushion Sage proactively addresses identity theft and privacy concerns. The order information, analytics, and related procedures associated with this business either meet or exceed the best established privacy practices in the industry.